I was thinking to construct a high voltage relay since those type of relays are expensive. This relay can be used to remotely fire (with a RC circuit) an EBW or a spark gap. There would be a spring that will always reset the 2nd electrode to its starting position. When current pass through the DC motor, the 2nd electrode will pass close to the 1st electrode triggering the circuit with an arc. What do you believe, would it be reliable ? Note that the swich must be as low in resistance and inductance as possible. Edited by THEONE, 22 June 2018 - 08:09 AM. Use a solenoid instead of the motor. Small linear movements is what solenoids are made for, and they are dirty cheap. When you talk high voltage, how high are you going to to? About 4,5 to 5kv. Thank you for your advice. Edited by THEONE, 22 June 2018 - 09:22 AM. The spark gap would need to be awfully small for that voltage. Jumping the gap becomes much easier once voltage reaches 7-10 KV. Once an arc is established it leaves a trail of ionized gas which allows the electrodes to bridge large distances but getting that initial spark requires the contacts to almost touch. 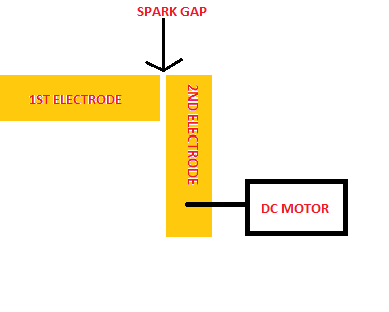 Will work just fine if not a spark gap will be created, but the 2 electrodes touch each other? Will this reduce efficiency? Is there any possibility that a simple 12v relay would work? Edited by THEONE, 22 June 2018 - 01:34 PM. The problem with the electrodes touching is that they could weld together. You should carefully choose the material of the electrodes. You told us the voltage, but how many current are we talking about? Maybe if you tell us what is the relay used for we can help a little more. Edited by THEONE, 22 June 2018 - 05:51 PM.